Here's a unit that I don't think I've ever photographed before - not sure how I missed them out! The idea is to make a unit with more special weapons than the others that is armed with laspistol & CCWs to also give them a close combat edge. I don't have a "Before" photo! 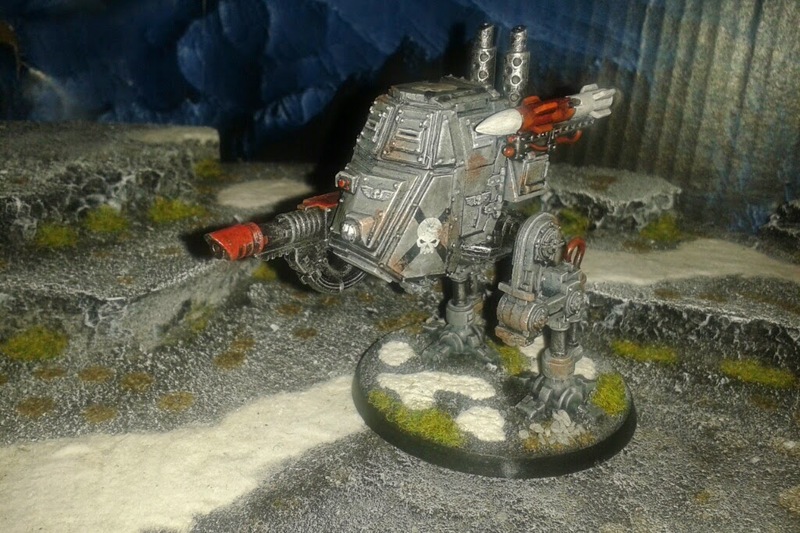 Here is the third of my four Heavy Weapons teams. 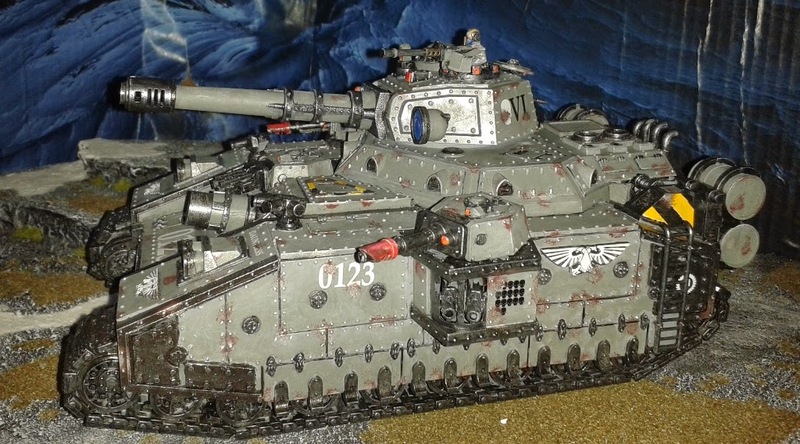 Like most of my armies, this is built from bits of scrap I picked up from ebay, hence the mixture of metal and plastic models and the mismatch between flat and bevelled bases. 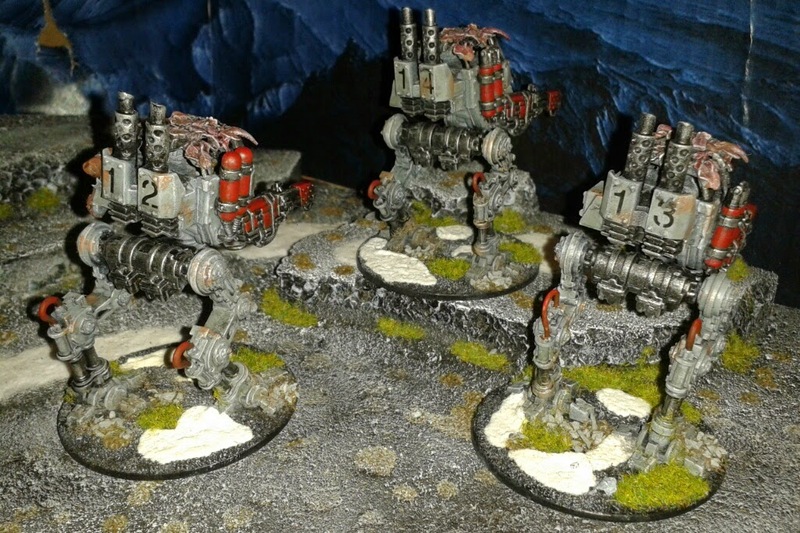 It's not an ideal way to build an army as you do get oddities like the base mismatching (which I try to make happen less these days) but at least you do get your army for a fraction of the money of buying new. 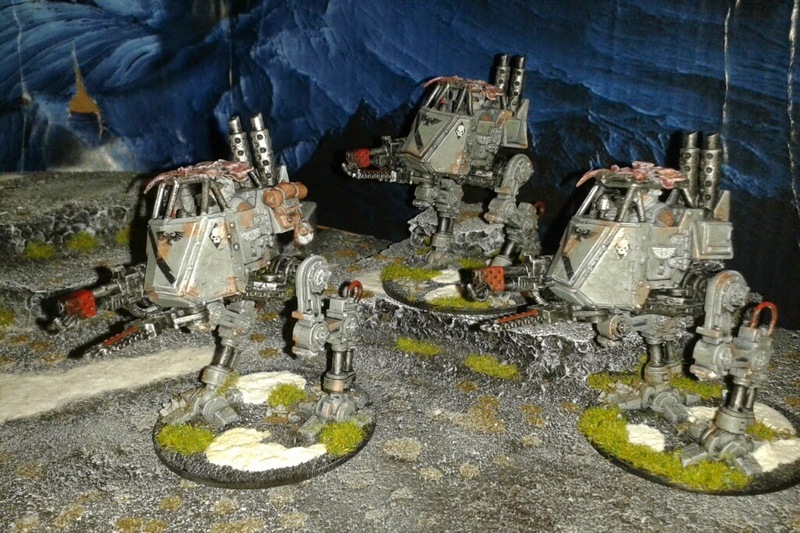 I've now completed work on the second full squadron of Sentinels for my Sentinel Platoon. 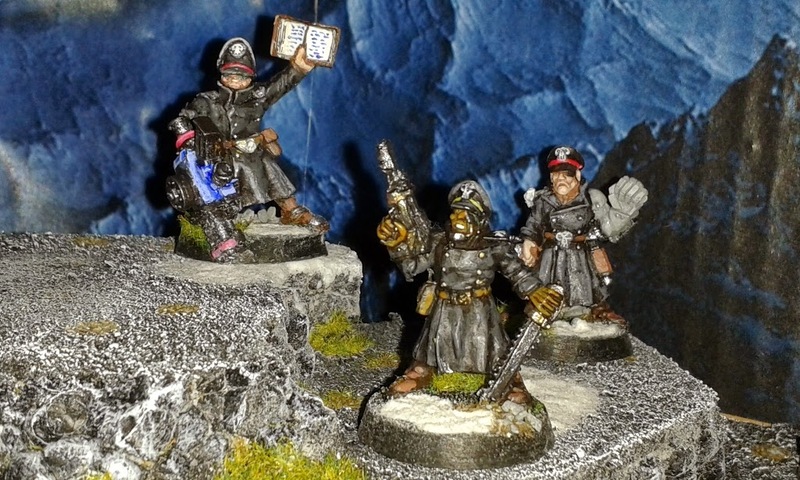 I'm already really excited about this - as well as an Apocalypse formation it occurred to me that these chaps would make an interesting Kill-Team. 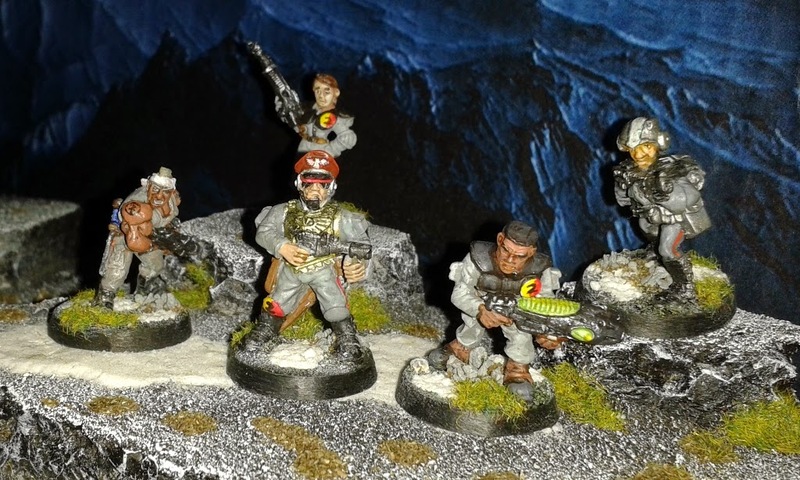 Here is my second collection of Commissar models that are often found accompanying the terrified Guardsmen on the battlefield. Getting into the last few units of foot troops now. Just a few left to go. One of the things that alwas happens to me at times like this is that I find myself noticing thigs I never noticed before. In this case it's that this unit has for some reason got *two* special weapons troopers in it, but one of them is wielding a plasma gun that hasn't had the plasma detail picked out in paint. I'll have to address both those things. Something's been swapped somewere 'cos he's not in the "before" pic. 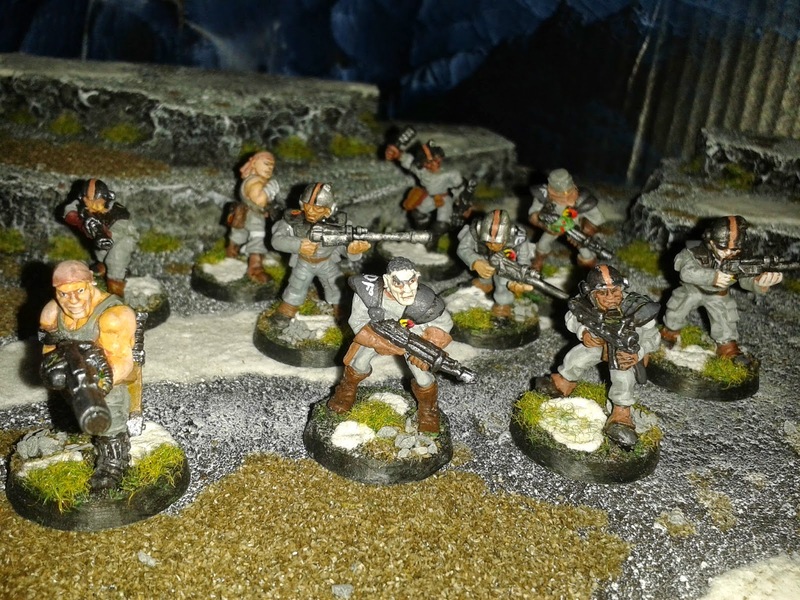 Ever more units to rebase. I almost forgot how big this army was. You may notice that this unit departs from the normal grey uniforms of the rest of my force. 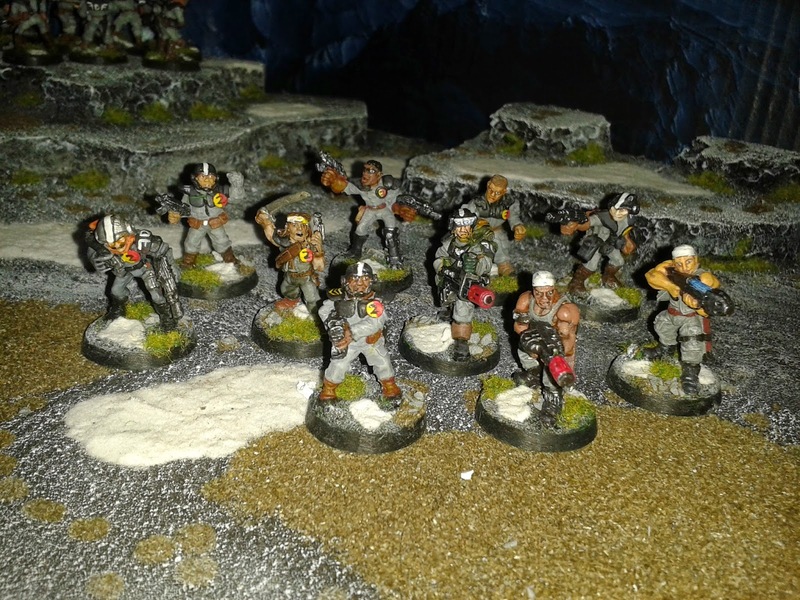 Also that they are a (comparatively) modern Catachan unit as opposed to my normal vintage troops. There's a good reason for both of these things. For a couple of Codex editions the rules supported the inclusion of prisoners into the Guard as Penal troops paying off their debt to the Emperor. So I went all "Con-Air" and produced these guys for a laugh. The rules no longer support that option, but I like the unit so I'm keeping it as-is. 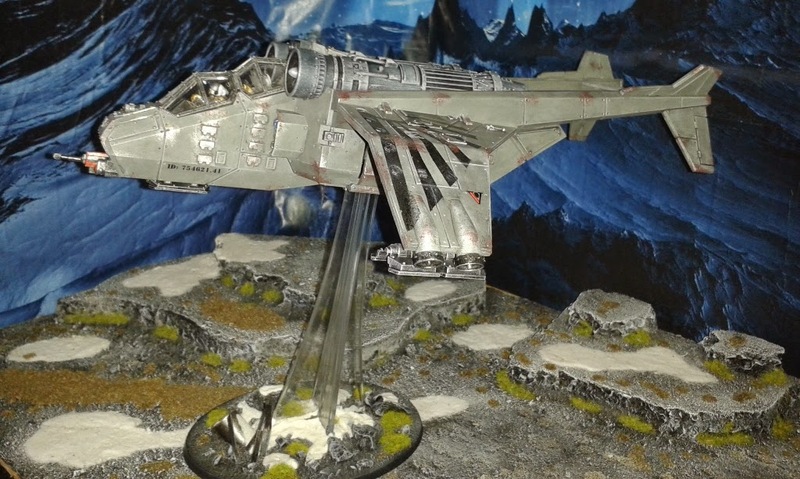 I took the time to rephotograph my Valkyrie on the rocky/snowy background I recently built for taking snaps of minis on. It's a vast improvement on my sofa, but it is a little tricky to fit large models into. 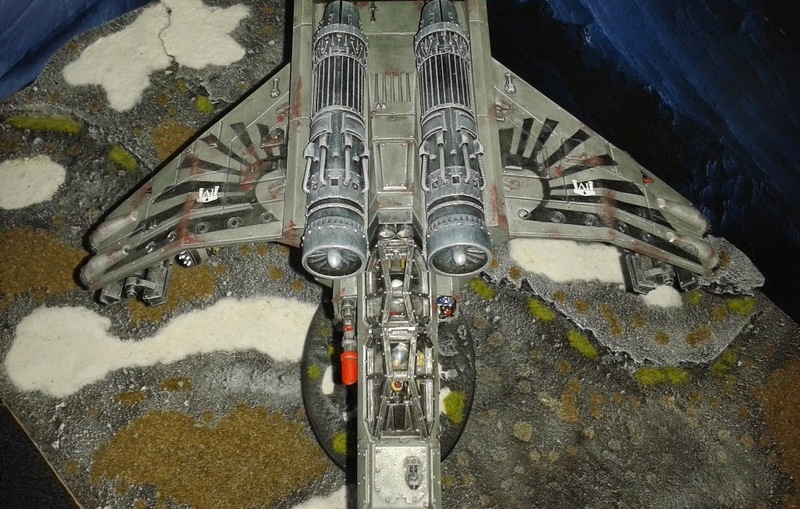 Anyway - since I'm updating the bases on all of my Imperial Guard and snapping them on this background it seemed wise to do the same for the Valkyrie. The process of creating this model is blogged here if anyone's interested. Here I am proud to present the first full squadron of Sentinels for my Platoon. 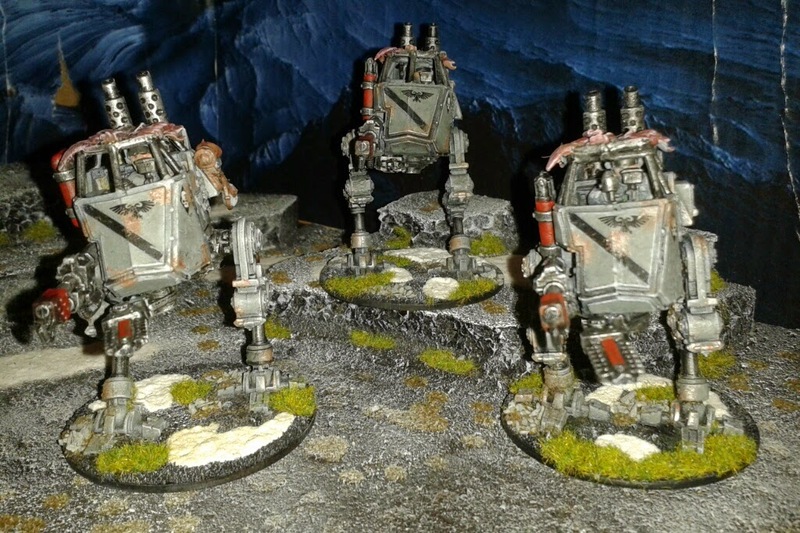 I have started with Scout Sentinels as they are moderately more difficult to paint due to being open-topped and also because my Guard had two of these models in it already which I have broken down, rebuilt and repainted. 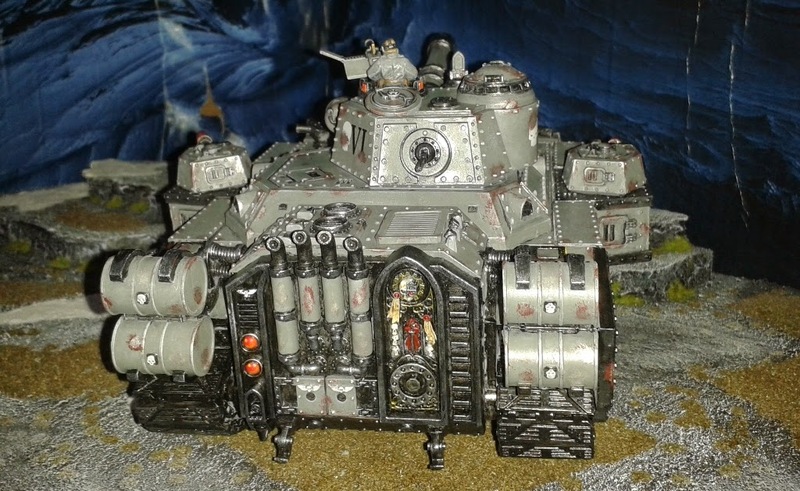 As I'm in the process of updating the basing on all my IG minis and adding a few units here and there it seemed an opportune time to update the photos of my Baneblade. Since I first painted it I've built the rocky/snowy backdrop thing that I'm snapping all my other units against so I thought I'd get a few shots of the Baneblade in the same setting. 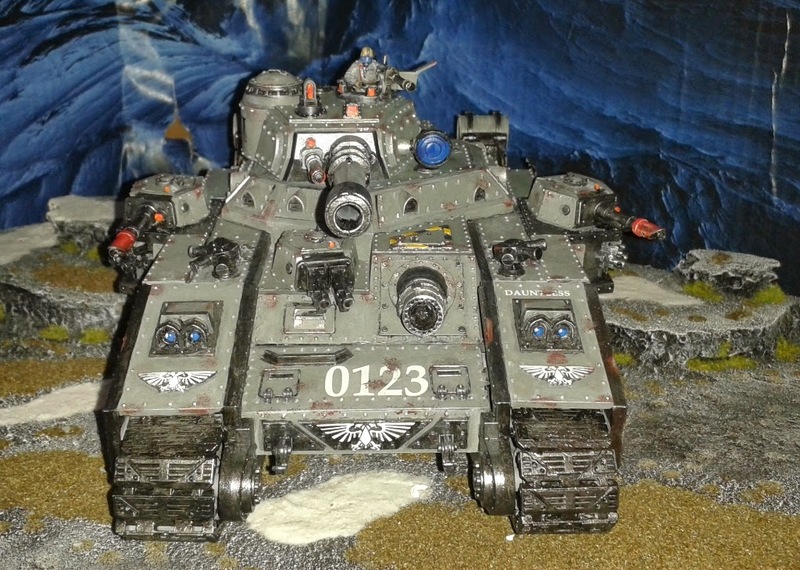 I thoroughly blogged painting the Baneblade here if anyone's interested in its history. 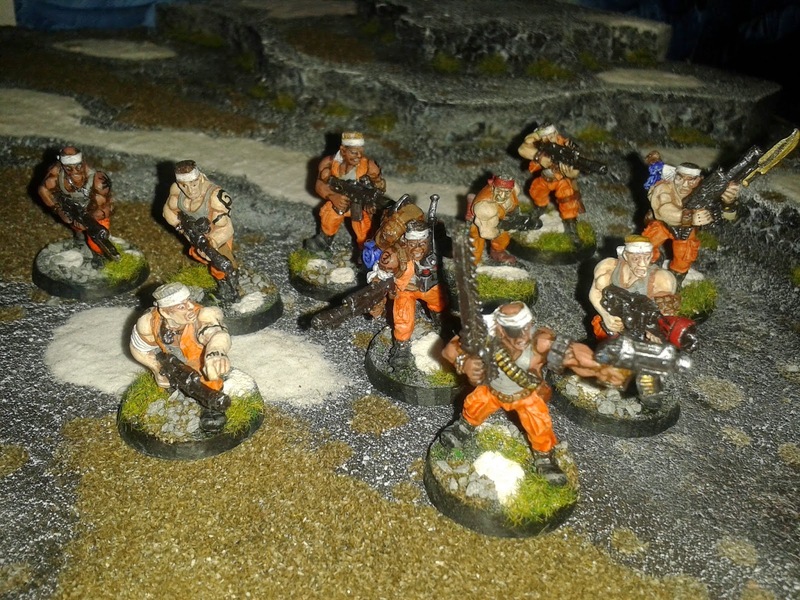 And another of my 10-man squads is rebased. 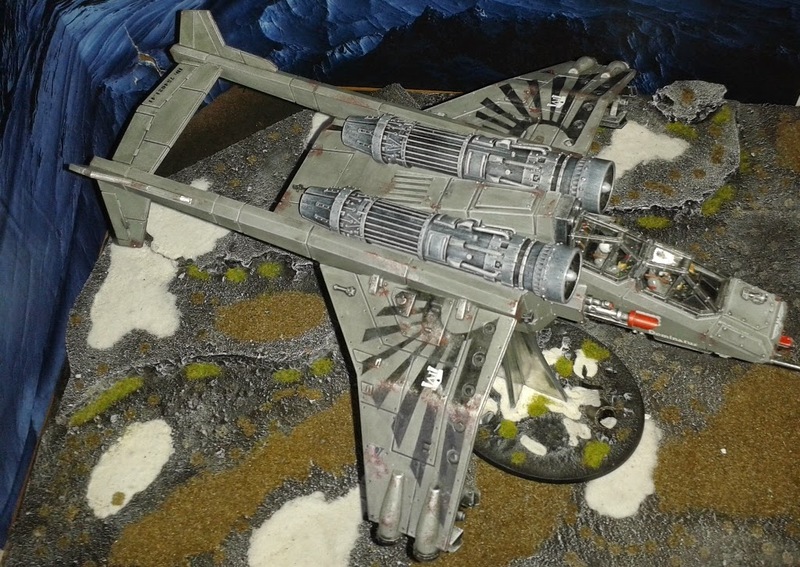 Most of the models here are vintage models, but there are a couple of old Catachan metal models to fill out numbers. And the rebasing project (like the Guard) keeps rolling on... Slow and Purposeful. 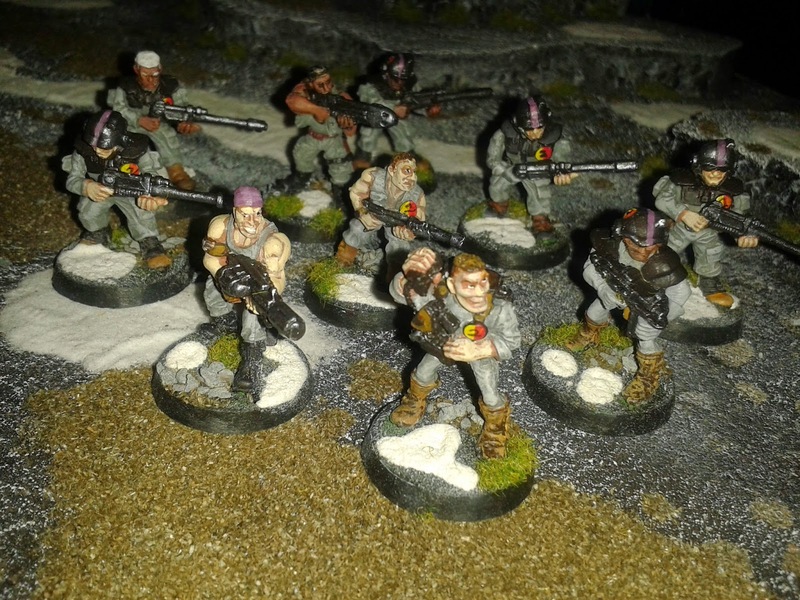 As I mentioned before, I've swapped a few models in-and-out of my various command squads so the membership of this squad has changed a little between the "Before" and "After" photos. In fact apart from the Junior Officer model, it's entirely different! Note the model at the back and left of the "After" photo - one of several female Guardsmen I have in my force. 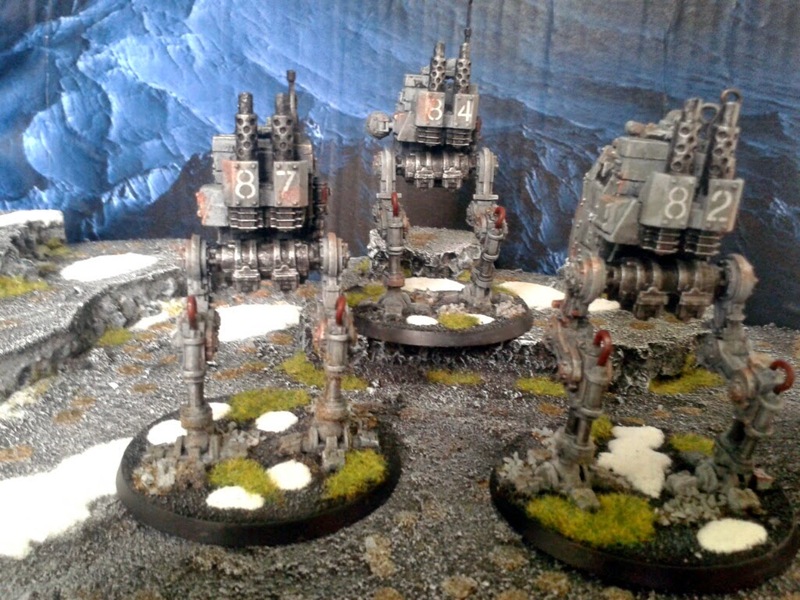 Here's another of my Heavy Weapon Squads on its updated bases. Too many models! Too many bases! Getting there though. Nearer the end than the beginning. 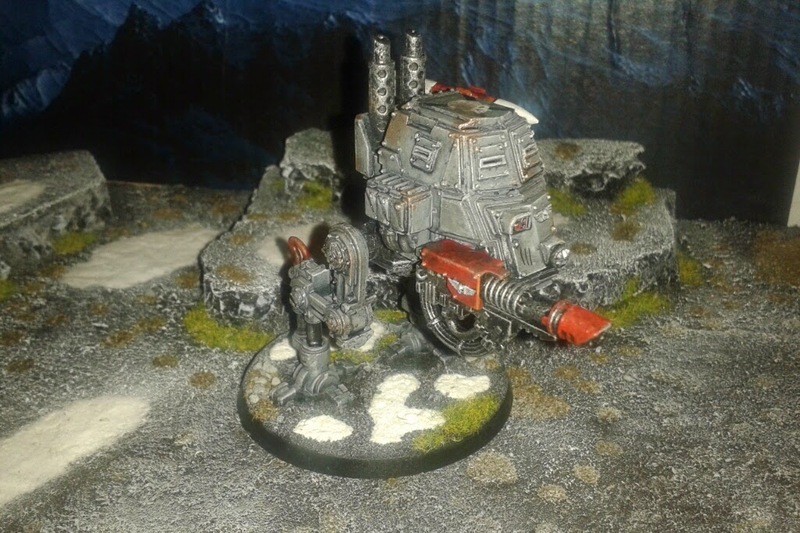 An anti-personnel squad this time - Heavy Bolters and Autocannons. 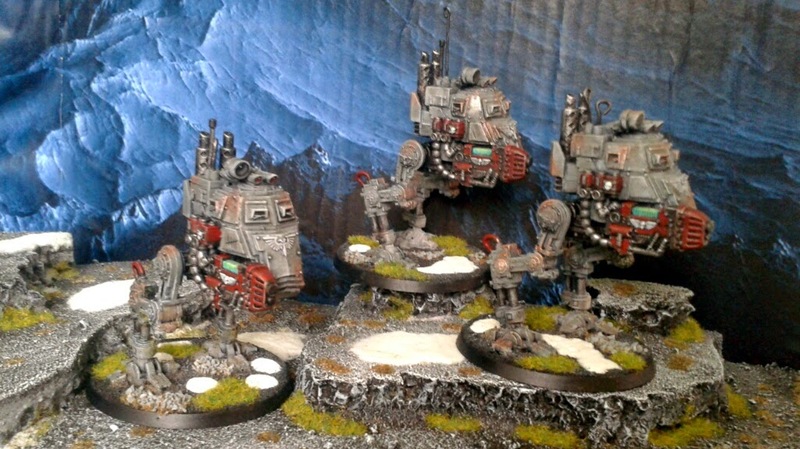 Many weeks ago I wrote a post about wanting to build an Apocalypse formation for my army in the shape of a platoon of Sentinel walkers. Nothing happened for weeks because I failed to buy the paint I needed and then got sidetracked into rebasing the guard. 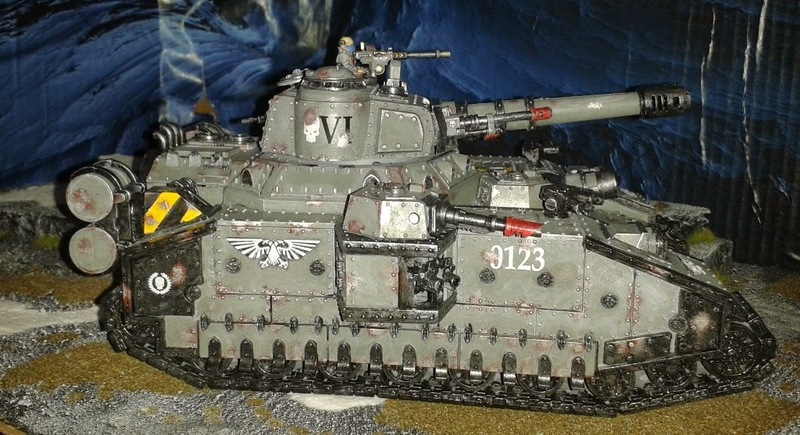 Well I'm formally back on track and here is the first model for the platoon, the boss man! On the whole I avoid named characters when building armies. I've never really liked the idea of them, preferring to play my own chapters/forces and so on. That doesn't always gel with having a named character in the army (certainly with Space Marines). 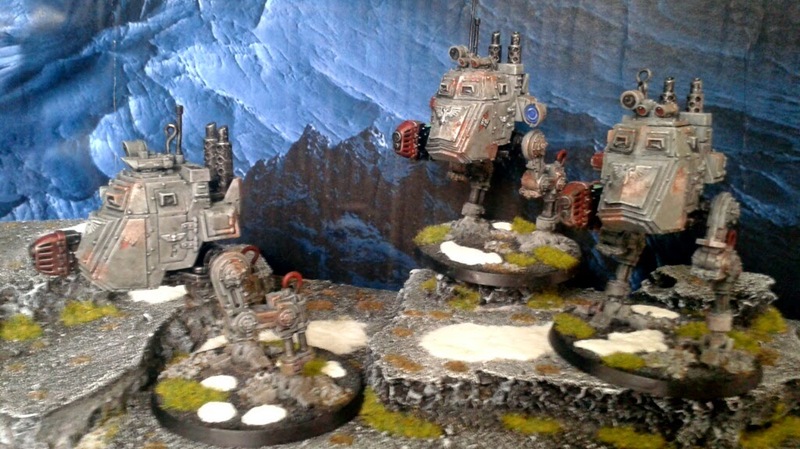 I have only two exceptions - Yarrick and some Tau characters (Farsight and Aun'Va - neither of which are yet built/painted). All are for the same reason: I got them accidentally. 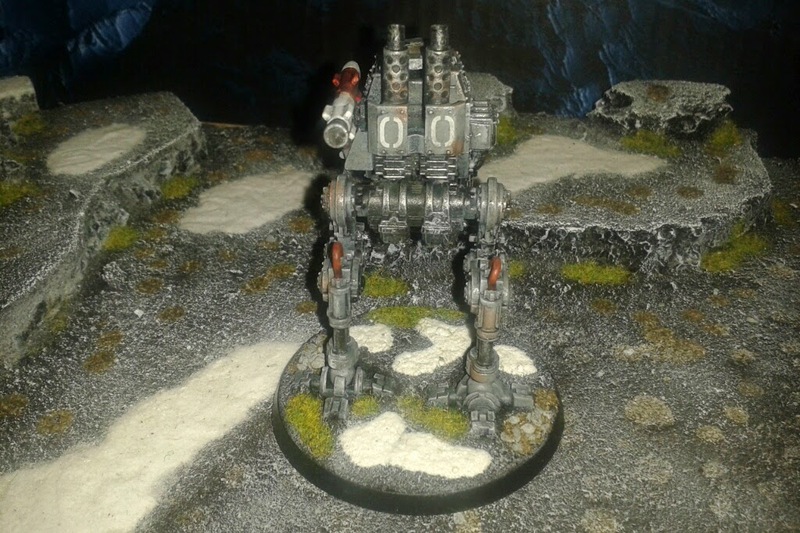 Either as part of ebay lots (Yarrick) or as a result of inheriting the army (Tau). 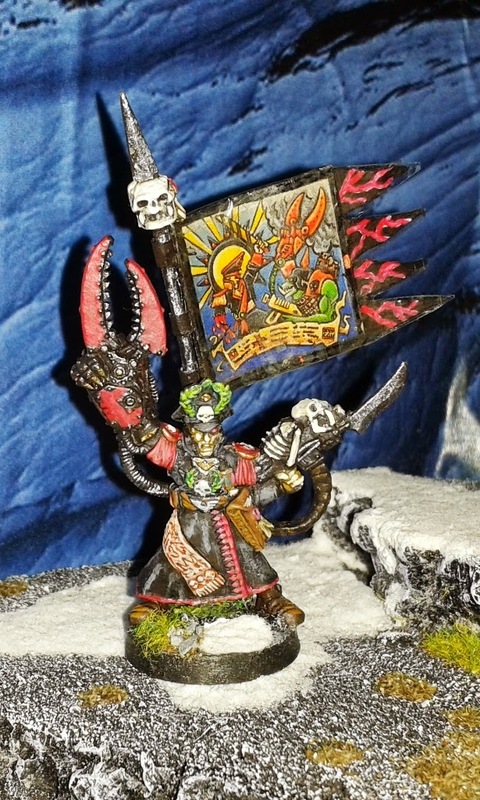 As with a lot of my models, this is an old, old Yarrick mini. I'm not sure of the exact date, but I did find a reference that said it was pictured in the 2nd Ed. rulebook, which would place it in the early 1990s.